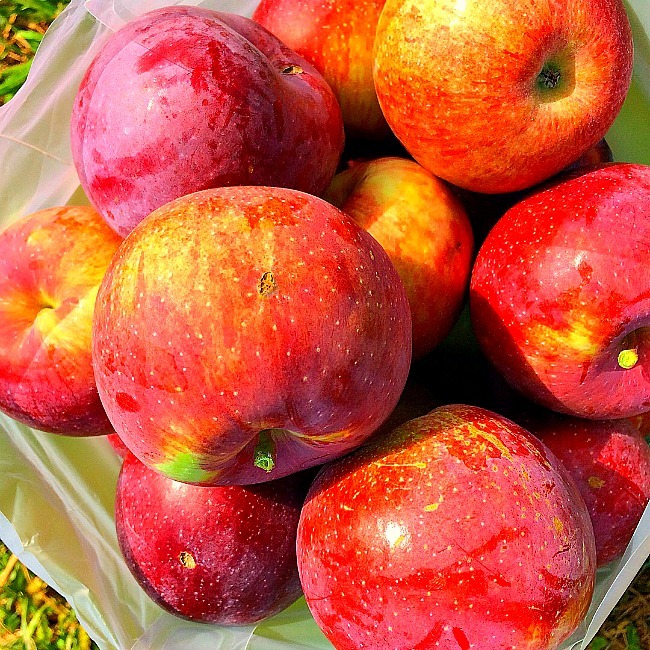 These 11 Central Maryland locations are simply the best pick your own fruit farms and orchards in the area. Great strawberries, blueberries, raspberries, blackberries, peaches, and apples! 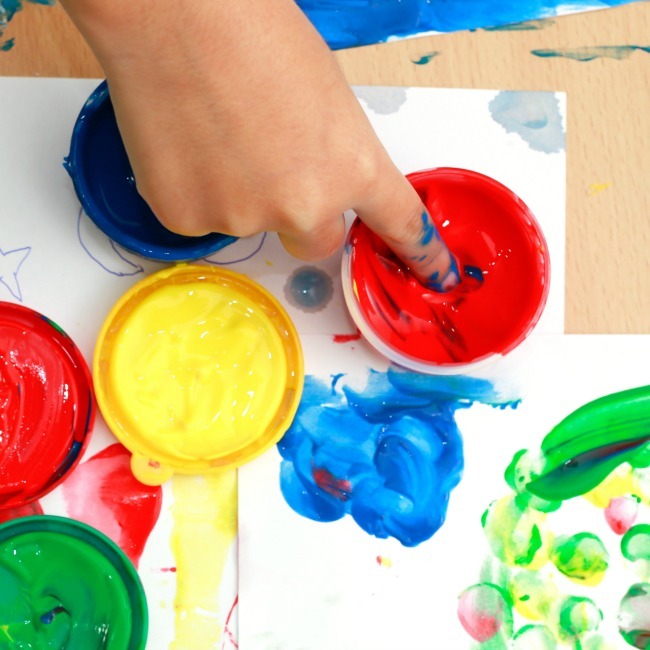 Sometimes, the simplest activities make the best childhood memories. Driving up to the edge of a farm, armed only with a wide brimmed hat and rain boots. Jumping over the mud puddles at the low points in the picking row, stooped over, turning over every leaf in search of perfection. Bright, red, plump berries. Your mouth starts watering immediately because you can almost taste the delicious strawberry shortcake you will make with your kids that afternoon. Or maybe it is August. Hot, sticky, August. The wagon jostles along the dusty dirt road to the edge of the peach trees. 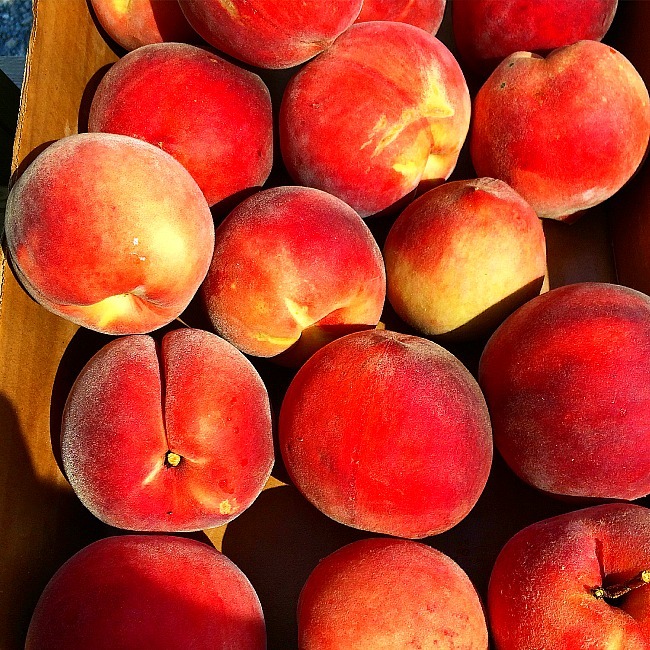 You walk halfway down your row and then you see them; the biggest, most delicious looking peaches you have ever seen. Seriously, your three year old plucks one off the tree and it is almost as big as half her head! Later, after your fruit has been weighed and paid for, you relax on the shaded porch and bite into one of these beauties– you can’t help but giggle a little bit as the juice runs down your chin. 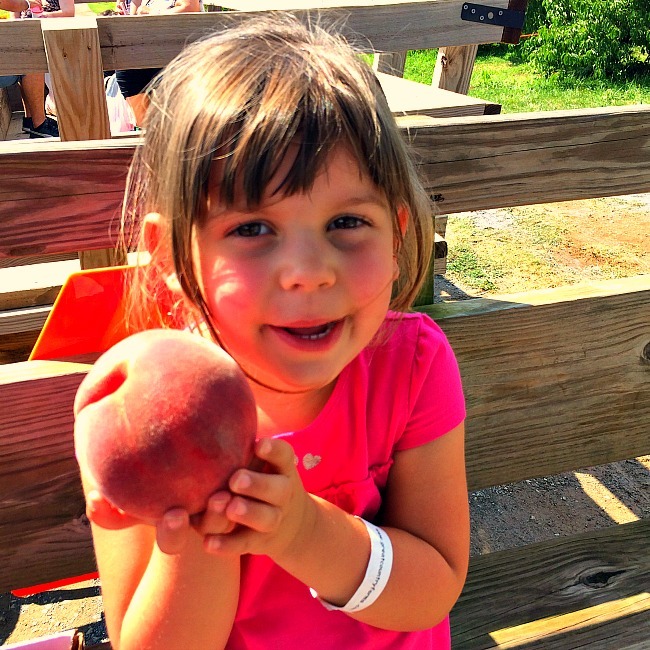 Who would have thought picking fruit with your kids would become such a cherished memory? Thankfully, there are scores of great pick your own farms in Maryland. 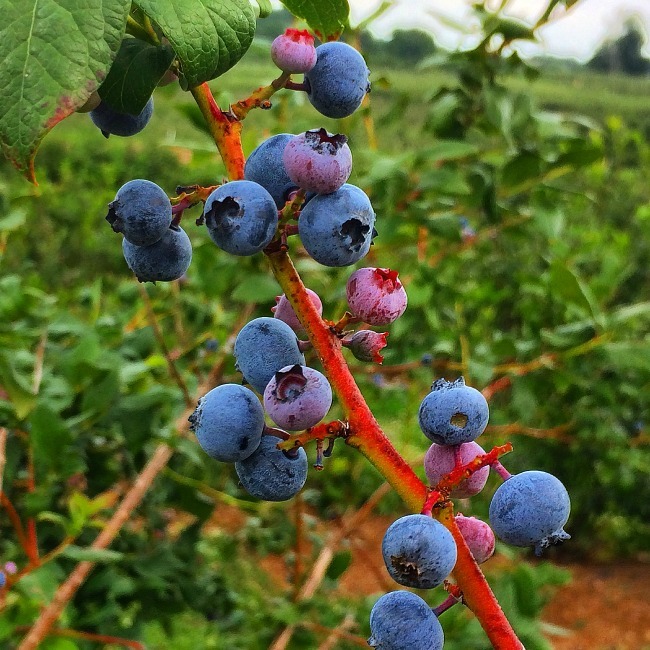 This post highlights the best Pick Your Own Fruit Farms in Central Maryland and will give you insider details on where to find the best pick your own strawberries, blueberries, cherries, blackberries, raspberries, peaches, and apples. Hmmmmm….. are you hungry yet? For the purposes of this post I am defining Central Maryland as anything about an hour from Howard County, which is pretty much in between DC and Baltimore. I also included the county to give you a better idea of where the farm or orchard is located. 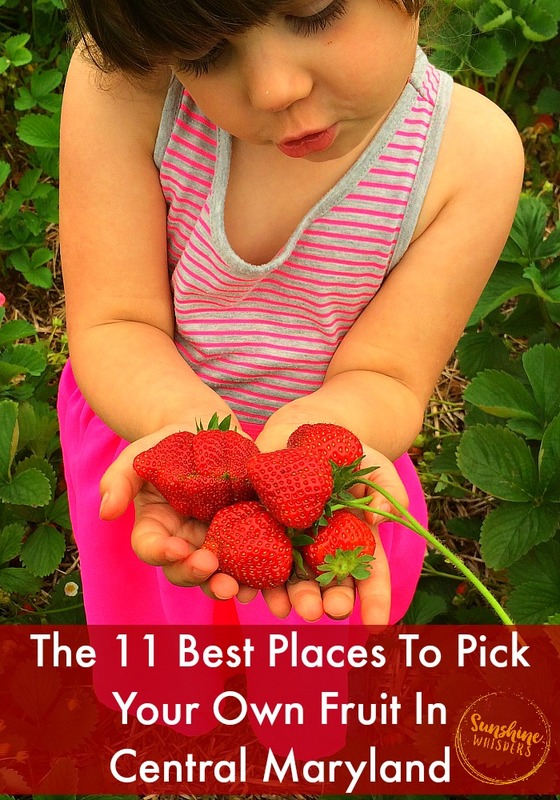 Pick you own for pretty much any fruit you can think of plus many vegetables and flowers! Stop by the Red Barn Farm Market for delicious treats, to go potty, and to let your kids feed the farm animals out back! Accepts cash and credit card. Pick your own for most popular fruits (except peaches) and heirloom tomatoes. 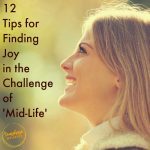 New in 2017, they have started a pick your own sunflower field as well! Butler’s Orchard puts on some fantastic special events for the Fall and Easter. 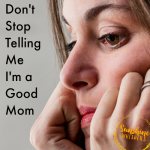 Click the hyperlinked text for my reviews! 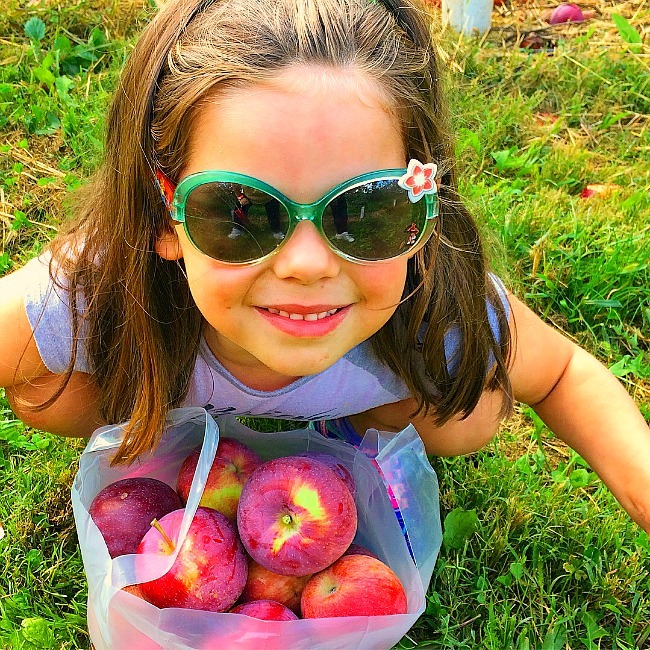 At Butler’s Orchard you purchase a day pass or family pass that includes a ride out to the picking fields and access to the giant slides, farm animals, and nature trails. Pick Your Own for strawberries, cherries, peaches, and apples. You can read my review of our apple picking experience here. You pay a minimal fee to ride out to the picking fields. Afterwards, let your kids play on the great playgrounds (there are two of them) and visit the petting farm! Also, there is a market with delicious pre-picked fruits and veggies plus amazingly delicious baked goods. There is also a snack bar open seasonally (peach slushies and cider donuts are our favorites!) and a restaurant just down the road. 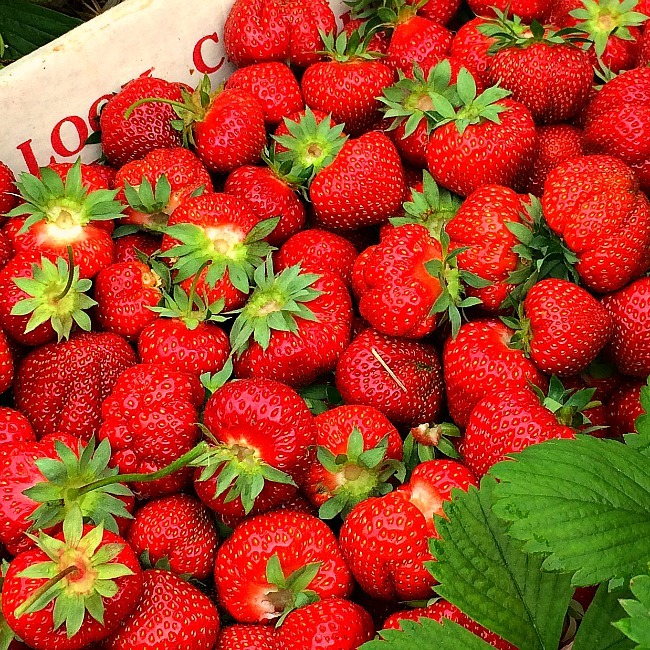 Pick Your Own strawberries in late May and early June each year. Gorman Farms is primarily a CSA farm in Howard County. Pick Your Own crops include blueberries, blackberries, raspberries, and apples. This is a 100% certified organic fruit farm and has been since its inception. It is a working farm (most of the farms on this list are) so come dressed to plod through fields. The farm charges $8/lb for picked organic berries and you can bring your own container or use the containers they provide. There are port-a-potties on site. Accepts cash or credit card payment. After you pick your fruit stay for ice cream and freshly made fruit pies! There are swings and a slide play house for kids. 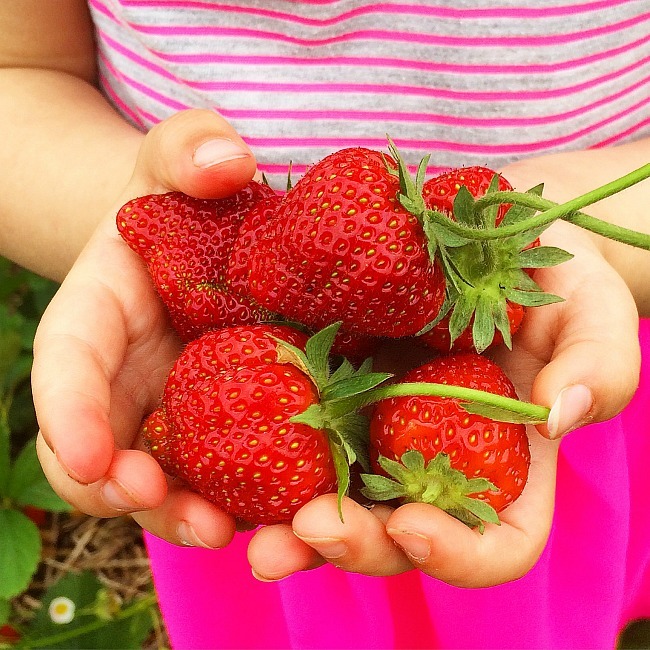 Pick Your Own crops include: strawberries, blueberries, blackberries, peaches, and apples. Peachberry Farm is separate from Cider Mill Farm (which hosts a lovely fall festival starting in September) but they are owned by the same family. Once you pick your fruit, stop by their bakery for delicious pies and baked goods, ice cream, and homemade fudge. Oh wow… my mouth is watering. Prices are posted at the field, containers are provided, and port-a-potties are located at the picking fields. Pick Your Own crops include: cherries, blueberries, black raspberries, and apples. They also have a lot of other crops that are pre-picked and for sale like strawberries, peaches, and veggies. There is a $2 entrance/wagon ride to the picking fields fee and it appears that pick your own is cash only (at least for the apples. The website isn’t clear about the other fruits). Catoctin Mountain Orchard also has a wide variety of pick your own flowers, including sunflowers! After picking your fruit stop by the bakery for a wide variety of fresh pies, dumplings, cookies, cakes, and breads! Pick Your Own crops include: strawberries, sour cherries, peaches, and apples. They also make super yummy cider donuts in the fall. Lohr’s runs a retail produce stand off of Rt 22 every year starting in July. Pick Your Own crops include: Strawberries, Raspberries, Blueberries, Cherries, Peaches, and Apples. Pick Your Own crops include: strawberries, tart cherries, blueberries, blackberries, peaches, and apples. 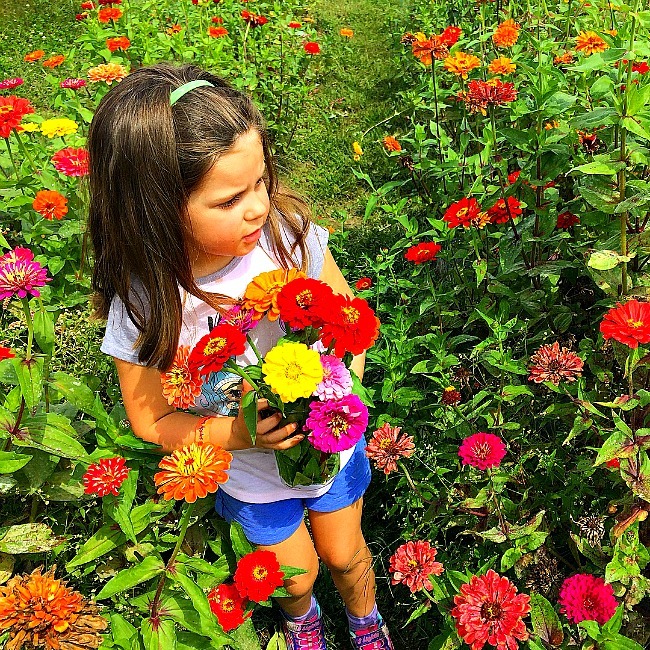 Homestead Farms also has a pick your own flower patch! Don’t forget to stop and feed the goats and see the alpacas and chickens. There are hay bales kids can climb on too. Port-A-Potties are available on site. Homestead Farms accepts cash and credit. Pick Your Own crops include: peaches, cherries, blackberries, apples. Rock Hill Orchard is co-located with the Woodbourne Creamery, part of the Maryland Ice Cream Trail. There are also lovely pick your own flowers at the orchard. You can help bottle feed the calves at 4pm on fall weekends and you can also see the Guernsey cows be milked. When is picking season for my favorite pick your own fruit? Strawberries– typically mid or late May until early or mid June. Southern Maryland will have strawberry picking season before Maryland farms closer to the Pennsylvania border. 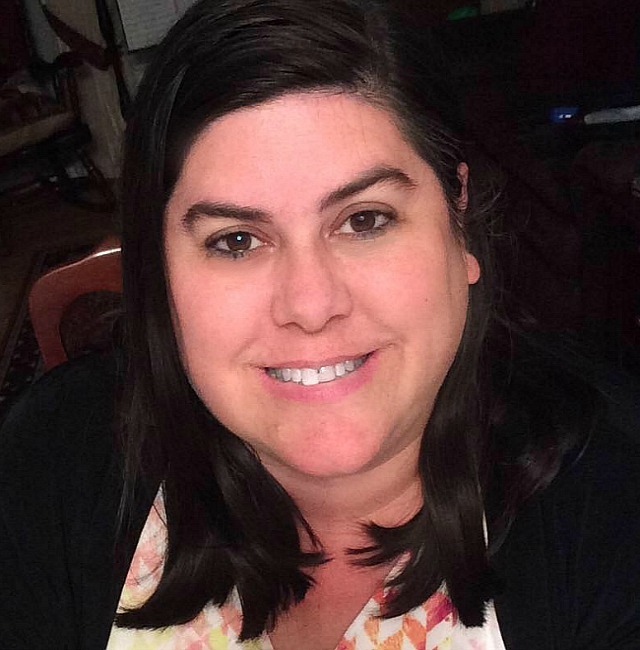 Previous Post: « Everything You Want To Know About Prince George’s County Imagination Playgrounds!